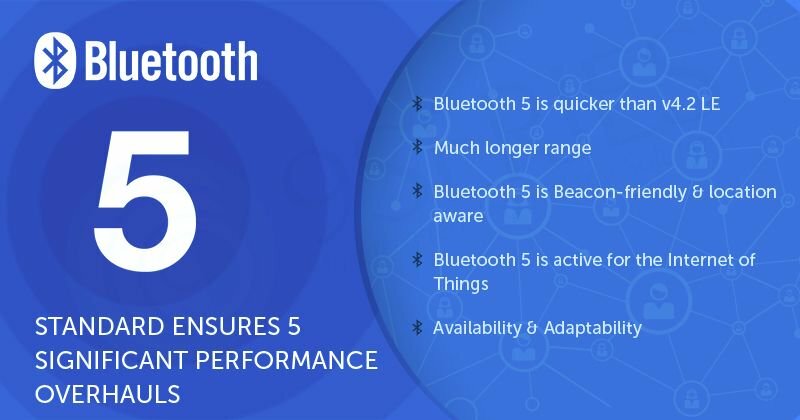 Bluetooth 5 (not 5.0 - to simplify marketing messages and communication) was released last year. The main features being 2x Faster, 4x Range (Bluetooth 4 - 50m outdoors, 10m Indoors; Bluetooth 5 - 200m outdoors, 40m indoors) & 8x Data. I like this above slide by Robin Heydon, Qualcomm from a presentation he gave in CW (Cambridge Wireless) earlier this year. What is highlights is that Bluetooth 5 is Low Energy (LE) like its predecessor 4.0.For anyone interested, a good comparison of 5 vs 4.2 is available here. In addition, Mesh support is now available for Bluetooth. I assume that this will work with Bluetooth 4.0 onwards but it would probably only make sense from Bluetooth 5 due to support for reasonable range. The Bluetooth blog has a few posts on Mesh (see here, here and here). I like this simple introductory video below. Long distance Bluetooth can also be extended with the newly supported mesh protocol. 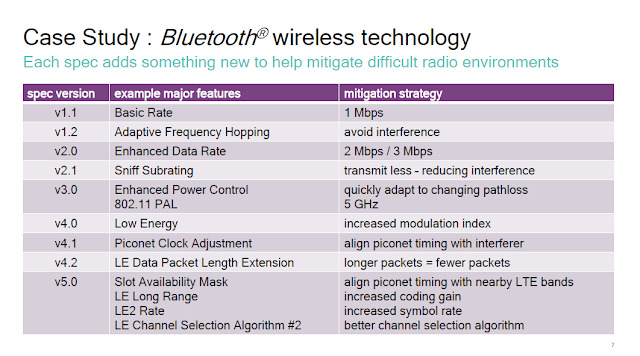 This brings Bluetooth into direct competition with a number of other radio systems including 802.15,4 based protocols such as Zigbee, LoRa, Wireless-M (for meter reading), Thread and 6 LowPAN (IPV6 over local area networks. 802.11 also has a mesh protocol and long distance ambitions including 802.11ah Wi-Fi in the 900 MHz ISM band. It also moves Bluetooth into the application space targeted by LTE NB IOT and LTE M though with range limitations. There are some interesting design challenges implied by 5.0. The BLE specification is inherently less resilient to interference than Classic or EDR Bluetooth. This is because the legacy seventy eight X 1 MHz channels within the 20 MHz 2.4 GHz pass band are replaced with thirty nine two MHz channels with three fixed non hopping advertising channels in the middle and edge of the pass band. These have to withstand high power 20 MHz LTE TDD in Band 40 (below the 2.4 GHz pass band) and high power 20 MHz LTE TDD in band 41 above the pass band (and Band 7 LTE FDD). This includes 26 dBm high power user equipment. The coexistence of Bluetooth, Wi-Fi and LTE has been intensively studied and worked on for over ten years and is now managed with surprising effectiveness within a smart phone through a combination of optimised analogue and digital filtering (SAW and FBAR filters) and time domain interference mitigation based on a set of industry standard wireless coexistence protocols. The introduction of high power Bluetooth however implies that this is no longer just a colocation issue but potentially a close location issue. Even managing Bluetooth to Bluetooth coexistence becomes a non-trivial task when you consider that +20 dBm transmissions will be closely proximate to -20 dBm or whisper mode -30 dBm transmissions and RX sensitivity of -93 dBm, potentially a dynamic range of 120dB. 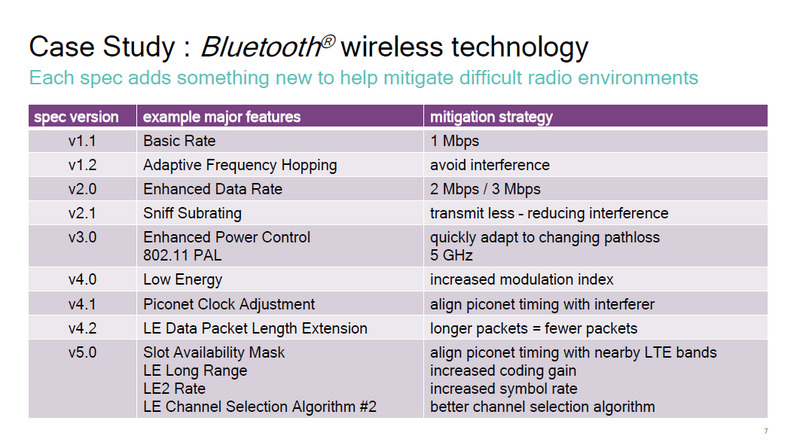 Though Bluetooth is a TDD system this isolation requirement will be challenging and vulnerable to ISI distortion. Bluetooth mesh is a scalable, short-range IoT technology that provides flexible and robust performance. 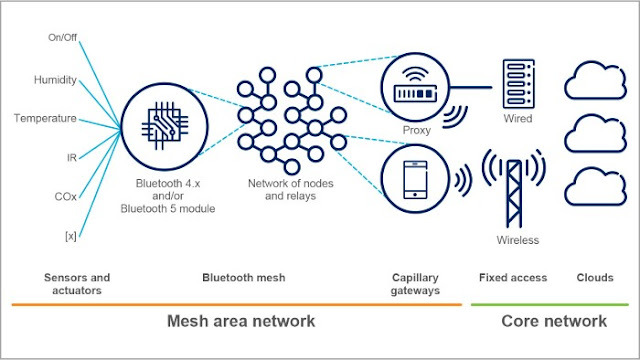 The Bluetooth Mesh Profile is an essential addition to the Bluetooth ecosystem that enhances the applicability of Bluetooth technology to a wide range of new IoT use cases. 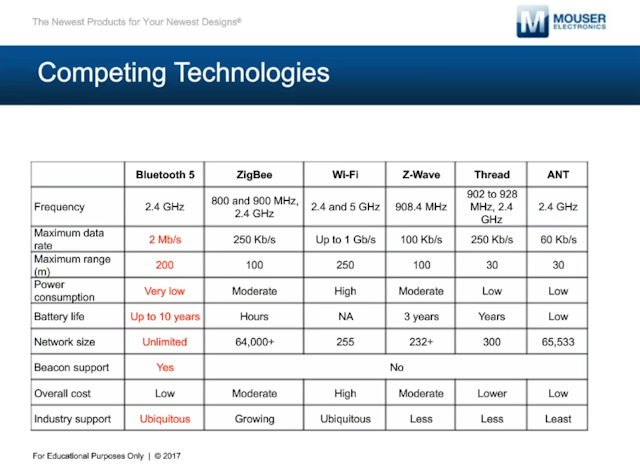 Considering the large Bluetooth footprint, it has the potential to be quickly adopted by the market. With proper deployment and configuration of relevant parameters of the protocol stack, Bluetooth mesh is able to support the operation of dense networks with thousands of devices. The building automation use case presented in this white paper shows that Bluetooth mesh can live up to high expectations and provide the necessary robustness and service ratio. Furthermore, the network design of Bluetooth mesh is flexible enough to handle the introduction of managed operations on top of flooding, to further optimize behavior and automate the relay selection process. 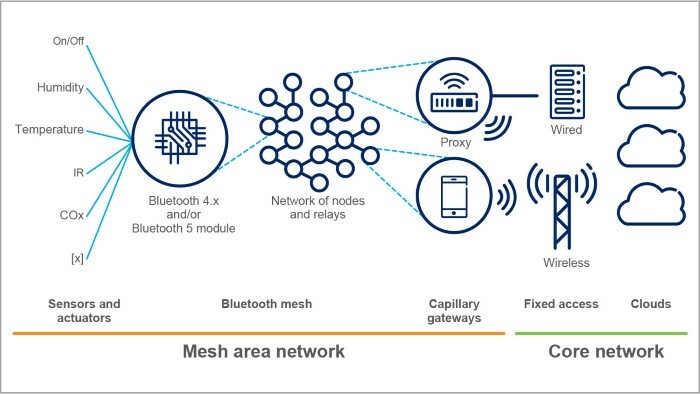 Moreover, another Ericsson article says that "smartphones with built-in Bluetooth support can be part of the mesh, may be used to configure devices and act as capillary gateways." A capillary network is a LAN that uses short-range radio-access technologies to provide groups of devices with wide area connectivity. Capillary networks therefore extend the range of the wide area mobile networks to constraint devices. Figure above illustrates the Bluetooth capillary gateway concept. Once there are enough smartphones and Bluetooth devices with Bluetooth 5 and Mesh support, It would be interesting to see how developers use it. Would also be interesting to see if it will start encroaching LoRa and Sigfox markets as well.